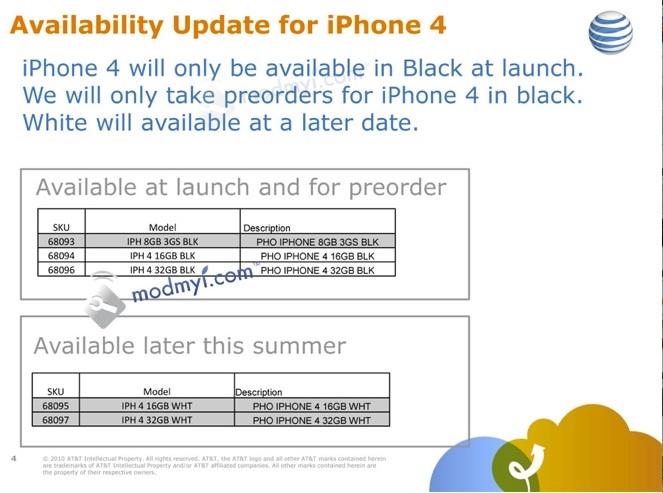 It isn’t like Apple to keep us in the dark about something like this until the day before pre-orders start but according to ModMyi (and some pretty convincing graphics from AT&T? ), those who prefer their iPhones in white will have to wait until “later this summer”. Maybe white is an Apple exclusive? What say you Apple/AT&T?! UPDATE: DeutscheTelekom has confirmed this for their stock in Germany on their Twitter page.